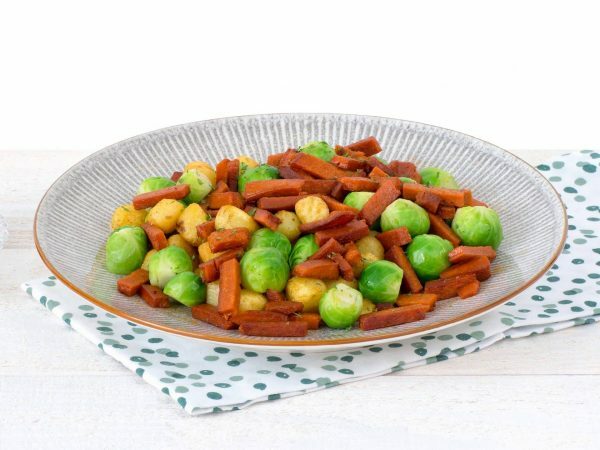 Delicious vegetarian bits of bacon that fit perfectly in the preparation of a salad meal, pizza, stew, mashed potato dish, or an oven dish. This product is available in various formats. Water, palm oil, vegetable protein 11% (soy, wheat gluten), egg white*, starch (potato, wheat, corn), salt, natural flavouring (egg), milk protein (lactose), herbs and spices, smoke flavouring, dextrose, colour (paprika extract, E163), acid (citric acid), mineral (ferrous fumarate), vitamin B12. * Free-range eggs. Produced in a facility that processes peanuts and nuts.